Brother Thomas Mary Sennott M.I.C.M. This excellent biography of two great American apostles and their defense of the Church should be read be all Catholic Americans. Orestes Brownson was received into the Catholic Church in Boston in 1844. Under the direction of Bishop Fitzpatrick he immediately began a vigorous campaign against the Native American persecution, stressing the necessity of the Catholic Church for salvation and at the same time demonstrating the complete compatibility of this claim with the duties of American citizenship. In 1949, just a little over a hundred years later, in the same city of Boston, four teachers were fired for accusing Boston College of teaching heresy, namely that it was possible to be saved outside the Catholic Church. When Father Feeney came to their defense, he was first silenced by the Archbishop of Boston, later expelled from the Society of Jesus, and finally "excommunicated" by Rome. Thirty two years later in 1972, on the initiative of Cardinal Medeiros of Boston and Bishop Flanagan of Worcester and with the approval of Pope Paul VI, Father Feeney was "reconciled" to the Catholic Church still professing the necessity of the Church and of submission to the Holy Father for salvation. 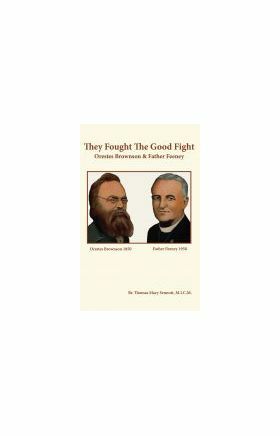 I have put the stories of these two courageous Catholics together, not just to show the difference that a hundred years made in the same city in the profession of the same Catholic doctrine, but mainly because their teachings on salvation admirably complement one another. Father Feeney did not show, as he probably should have, how the doctrine of extra Ecclesiam nulla salus was compatible with the American principle of religious freedom which was developed at length in Vatican Council II. Brownson treated this subject with great skill, especially in his Civil and Religious Toleration, and it is part of the reason for his success in the campaign against the Know-Nothings. Also, although Father Feeney always thought that some persons who had apparently died as Protestants could have been saved (most notably Mother Seton’s husband and father in his earlier writings), he never set forth the necessary conditions they would have had to meet. Again, Brownson, under the direction of Bishop Fitzpatrick, clearly spells out these conditions in The Great Question. St. Thomas in his first position paper, Reply to a Liberal, he later in his Bread of Life, in what turned out to be his final statement on the doctrine, adopted the opinion of St. Augustine who taught that a catechumen could not be saved in such circumstances. The account which follows is drawn entirely from the major docu-ments in the Father Feeney Case, and the interpretations expressed in the various introductions and footnotes are entirely my own, and do not necessarily represent the opinions of all the members of the various St. Benedict Center communities. This book is not intended to be a biography of Father Feeney or a history of St. Benedict Center. I feel l am much too close to these events to be completely objective, so I have tried only to compile a summary of the major documents involved, confining my personal comments to the introductions and footnotes. But since the Father Feeney Case is now forty years old, a brief review at the beginning would certainly be in order. One of the best summaries of the case was written by Fr. Avery Dulles, S. J. at the time of the death of Father Feeney. Father Dulles, who was severely criticized by Father Feeney for his liberalism, was closely associated with St. Benedict Center only in the early forties, so some of the inaccuracies in his comments after that period are easily understandable. Although Father Dulles’ appreciation is more sentimental than doctrinal, I am sure that Father Feeney, who was always grateful for any kindness, would have been pleased.—T. M. S.
With the death of Leonard Feeney, at the age of 80, on Jan. 30, 1978, the United States lost one of its most colorful, talented and devoted priests. The obituary notices, on the whole, tended to overlook the brilliance of his career and to concentrate only on the storm of doctrinal controversy associated with his name in the late 1940’s and early 1950’s. I knew Father Feeney only slightly before the spring of 1946, at which time I settled in Cambridge, Mass., for several months as I was completing my naval service and preparing to enter the Jesuit novitiate in August. I came to Cambridge in order to rejoin St. Benedict Center, a lively gathering place for Catholic students, which I had been instrumental in founding, together with Catherine Goddard Clarke, some five years earlier. Mrs. Clarke, a woman of charismatic charm and contagious enthusiasm, had run the Center almost unassisted until 1943, when she obtained the services of Leonard Feeney as spiritual director. Father Feeney was then at the height of his renown. As literary editor of America, he had become a prominent poet and essayist, much in demand on the lecture circuit. He had preached on important occasions at St. Patrick’s Cathedral and had broadcast a series of sermons on “The Catholic Hour.” But when he came to Cambridge he soon decided to make St. Benedict Center his single, exclusive and full-time apostolate. By the time I returned in February 1946, the Center was teeming with activity. It was not simply a place where students could drop in for a cup of tea or a friendly chat, but also a bustling center of theological study and apostolic zeal. Equipped with an excellent Catholic library (with my own collection as part of the nucleus), the Center had set up interest groups of various kinds, most of which met in the evening on a weekly basis. For example, I joined a group led by Professor Fakhri Maluf, a Boston College professor, in which we exchanged papers, week by week, first on the angelology of St. Thomas and then on St. Bernard’s doctrine of the love of God. With Fakhri and several others, I was part of a smaller group that systematically worked through Joseph Gredt’s Latin textbook on scholastic philosophy, beginning with the formal logic. There was also a weekly evening on Dante, directed by Professor Louis Solano of the Harvard faculty, at which distinguished Boston converts, such as Daniel Sargent and Hugh Whitney, were frequent visitors. Other groups at the Center specialized in modern literature and dramatics. Shortly before leaving I took the primary responsibility for putting out the first issue of From the Housetops, a quarterly journal intended to disseminate the Center’s vision of an integrally Catholic culture. Soon after I left, the Center was to become officially registered as a Catholic school eligible to receive benefits under the G. I. Bill of Rights. Thursday nights at St. Benedict Center were, in a special way, for Father Feeney. He gave a carefully planned course of lectures, beginning with the act of faith and then passing on to the sacraments. His leading idea in these lectures seemed to be the integration of nature and grace. Faith he viewed as a sacrifice in which the believer offers to God the most excellent gift of reason. For the sacrifice to be meaningful it was essential, in Father Feeney’s estimation, to have a proper esteem for the value of reason. In these lectures he therefore taught us to love the senses, the imagination, the memory and all the faculties of the mind. So, too, when he came to the sacraments, he labored to instill into his hearers a deep appreciation of the elements used in the Church’s rituals — water, oil, bread, wine and the like. Following the same pattern, when he spoke of celibacy, Father Feeney took great pains to communicate a high regard for Christian marriage, on the ground that the renunciation of marriage could not be an acceptable sacrifice unless one regarded marriage as truly good. Not only was the doctrine solid, the oratory was superb. Never have I known a speaker with such a sense of collective psychology. Father Feeney would not come to his main point until he had satisfied himself that every member of the audience was disposed to understand and accept his message. In the early part of his lectures he would tell anecdotes, recite poems and in various ways gain the attention and good will of all his hearers. Totally aware of the reactions of every person in the room, he would focus his attention especially on those who seemed hostile, indifferent or distracted. When at length he had the entire audience reacting as a unit, he would launch into the main body of his talk, leading them from insight to insight, from emotion to emotion, until all were carried away, as if by an invisible force permeating the atmosphere. Week by week the audience grew. Every seat in the auditorium was filled; then every foot of standing space was taken up, and at last people gathered in groups at every open door or window to catch whatever fragments they could of these Thursday-evening talks. To Father Feeney, however, the popular lectures were not the most important part of his work. They were intended for a relatively wide public, not for the inner group of disciples. His main interest was in those who made the Center their principal occupation in life — those for whom it was a kind of family, school and parish all rolled into one. For this group Father Feeney would make himself available every afternoon, hearing confessions and giving personal direction. Later in the afternoon he would emerge for tea and a social hour. Then at supper time a group of us would generally pile into Catherine Clarke’s decrepit sedan so that we could continue our discussions over hamburgers in a restaurant. In the company of Catherine Clarke and Leonard Feeney conversation was never known to lag. To a meadow full of hay. And you want her to go away. As a spiritual director Father Feeney carefully trained his disciples. Although he was capable of sharp admonitions and rebukes, his general practice was to lead by positive encouragement. He was generous in praising others, both in their presence and when they were absent. When he noticed faults in the members of the group, he would correct these in a good-humored way, with playful mimicry, rhymes and puns. (For his views on the value and limits of the pun it would be worthwhile to read his little article, “How Much Do I Like a Pun?” Am., 9/26/36.) Father Feeney’s light-hearted mockery extended not only to members of the Center but to the public figures of the day. Parodying their rhetoric and mannerisms, he would deliver with mock solemnity imaginary speeches such as Al Smith on the fallacies in Descartes’s philosophy (“putting Descartes before the horse”), Fulton Sheen on the merits of Coca-Cola (“Ho, everyone that thirsteth for the pause that refreshes!”), Franklin Roosevelt on the decline of sacramental religion (“Some of our underprivileged are having to get along on two paltry sacraments, or even none”), and Katherine Hepburn reporting a championship prizefight. We listened to these imitations with our sides splitting, almost sick with laughter. Then at a crucial moment Father Feeney would be likely to remove his clerical collar, put it over his head like a wimple and begin to speak in the broken English of Mother Cabrini. But the humor, too, was only marginal to Father Feeney’s real concern. Most of all he enjoyed speaking directly about the truths of the Christian faith. With unbelievable vividness he would make the Gospel episodes come alive: scenes of the rich young man, of Zacchaeus in the sycamore tree and countless others. When he quoted from the letters of Paul one had the impression that Paul himself was speaking. To this day, I imagine St. Paul with the features and voice of Leonard Feeney. While teaching us to love the New Testament (not only in English and Latin, but in the Greek text he always had at hand), Father Feeney led us also to study the fathers and doctors of the Church. We easily memorized the list of the twenty-nine doctors, and their names were more than names to us. Father Feeney taught us the issues that made Athanasius an exile from his native Egypt. He explained why Cyril stood up against Nestorius and why Augustine wrote fiery tracts against the Pelagians and the Donatists. Under his direction we came to appreciate the equable wisdom of Aquinas and the more intuitive metaphysics of Duns Scotus, who especially appealed to the poet in Feeney, as he had to Gerard Manley Hopkins. Father Feeney familiarized us, also, with the Christian poets. His memory never seemed to falter when he quoted from Hopkins or Francis Thompson, from Belloc or Chesterton or, in English translation, from Peguy or Claudel. In addition to the lore of historical theology and Christian poetry, we were introduced into the profundities of speculative theology. Here again the oral teaching of Leonard Feeney was our principal guide. Outside St. Benedict Center, was there any place in the world where lay people in our day were so eagerly discussing the processions in the Blessed Trinity, the union of the two natures in Christ, the presence of Christ in the Mystical Body, the marvels of transubstantiation, the divinizing effects of sanctifying grace and role of Mary in God’s plan of salvation? The systematic theology that I learned from Father Feeney has stayed with me through the decades, while I have forgotten much of what I studied more recently. In part this is because he had an incomparable gift for putting the deepest mysteries in the simplest terms, as may be seen, for example, from his masterly essay, “The Blessed Sacrament Explained to Barbara.” It must also be said that at the Center the Catholic Faith was never just abstract doctrine to be memorized for an examination, but was always a truth to be lived and prayed. Nearly all the Center family were daily communicants and made great sacrifices of one kind or another to live their faith to the full. We had periodic days of recollection. Every evening at the Center ended with night prayers, when we would recite in common from memory the Prologue to the Fourth Gospel and pray to the Blessed Virgin for protection and fidelity. Life at the Center had an indelible effect on all the associates. Before long about one hundred members of the Center community had accepted vocations to the priesthood or the religious life, and an equal number, I would estimate, entered into deeply Christian marriages. All the time, new members kept pouring in. At least two hundred, it is reported, became converts to the Catholic Faith. All the Center’s projects seemed to prosper. An option for some was to affiliate themselves permanently with the Center. Already when I was there the Center was beginning to take on certain characteristics of a religious community—one open to both men and women, single and married, with Father Feeney in the role of superior and novice master. Only later did St. Benedict Center draw up a rule of life for its members as “Slaves of the Immaculate Heart of Mary. Were there, at the time I was present, any signs of the coming cataclysm? I did notice, toward the end of my stay, that Leonard Feeney was becoming increasingly polemical. His attacks on materialism, skepticism and agnosticism became sharper and more personal. He used bitter invective against Hume and Kant, Marx and Freud. At times he denounced “liberal Catholics” who had failed to support Generalissimo Franco. Even Jacques Maritain was in his eyes infected by the poison of liberal culture. Father Feeney’s attitude toward the Jews was ambivalent. He felt that they could not achieve their true vocation except in Christ, but that when they accepted this vocation they excelled all other Christians. In his lectures and conversation he made us savor the total Jewishness of Mary, of Jesus and of Paul. He used to talk of a certain Jewish taxi driver in New York whom he had instructed in the faith and who had become, in Father Feeney’s judgment, a true mystic. On the question of salvation outside the Church, Father Feeney had not as yet adopted any clear position. He was convinced that Catholics must not hesitate to present the full challenge of the Gospel, which for him included the whole system of official dogma. He felt that too many tended, out of politeness and timidity, to evade the task of forthright witness. As long as any person was alive, Father Feeney used to say, we should urge the necessity of his accepting the fullness of the faith. But after death, the situation was different. We could confidently leave our loved ones to the unfathomable mercy of God, to which we could set no limits. “I would infinitely rather be judged by God,” Father Feeney would say, “than by my closest friend.”* Hence the damnation of non-Catholics was not at that stage, as I recall, any part of the Feeney gospel. How did Leonard Feeney later become a proponent of the rigid and almost Jansenistic position attributed to St. Benedict Center? I have no personal knowledge of what happened in the late 1940’s. Perhaps Father Feeney was somewhat embittered by his encounters with the non-Catholic universities about him; perhaps, also, he was led into doctrinal exaggerations by his own mercurial poetic temperament. Then again, he and others may have been somewhat intoxicated by the dramatic successes of the Center and too much isolated from opinions coming from outside their own narrow circle. It occurs to me also that the religious enthusiasm of some of Father Feeney’s convert disciples may have led him further than he would have gone on his own. He was ferociously loyal to his followers, especially those who had gone out on a limb to defend what they understood as his own teaching. Thus, when several faculty members at Boston College were dismissed for their teaching on salvation, he backed them to the hilt. From that moment the developments leading to Father Feeney’s excommunication and to the interdiction of the Center were all but inevitable. For those who loved and admired Father Feeney it was painful to see illustrated newspaper articles about him on Boston Common, flanked by burly bodyguards, shouting vulgar anti-Semitisms at the crowds before him. No doubt he did become angry and embittered in the early 1950’s, but happily this was only a passing phase. St. Benedict Center, after it moved to Still River, Mass., in January 1958, became a different kind of community, more in keeping with the Benedictine spirit to which Father Feeney himself had long been attracted. Thus it became possible for the major portion of the community, including Father Feeney himself, to be reconciled to the Catholic Church in 1974. Two years later two members of this community were ordained to the priesthood so that they could carry on Father Feeney’s ministry to the “pious union of Benedictine Oblates” that has sprung forth from the St. Benedict Center. It would have been tragic if Leonard Feeney, the great apostle of salvation within the Church, had died excommunicate. Cursum consummavi, fidem servavi: These words could serve as Leonard Feeney’s epitaph. They express his overriding concern to resist any dilution of the Christian faith and to pass it on entire, as a precious heritage, to the generations yet to come. In an age of accommodation and uncertainty, he went to extremes in order to avoid the very appearance of compromise. With unstinting generosity he placed all his talents and energies in the service of the faith as he saw it.